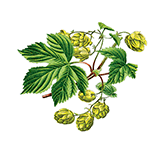 Historically, hops was used in folk medicine as a tonic, sedative and anti-inflammatory agent to reduce swelling. It inhibits skin aging. Improves skin structure overall. Hops extract strengthens hair and protects it against brittleness and becoming dull.